Super easy and totally delicious meal prep recipe for you today! 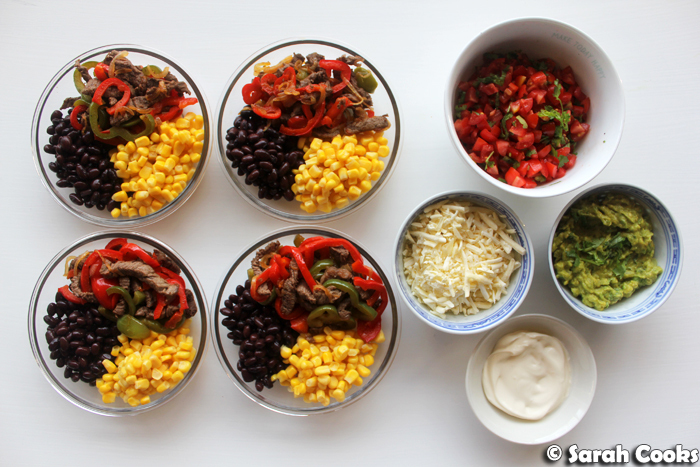 Beef fajita bowls with black beans, corn, tomato salsa, guacamole, sour cream and grated cheese. One of my favourite meal preps from last year was my chicken fajita bowls - Sandra really liked them too, so she requested them often, and they were on high rotation throughout 2017. Not only did they taste great, but they were healthy and easy to make. The carbs (black beans and corn) come out of a can, so that's one less pot to wash up, and the whole thing was totally doable on a Sunday arvo when motivation was low, but desire for good food was high. When I made these beef fajita bowls, I had been feeling rundown and was craving some red meat. I thought beef would make a great substitute for the chicken in my fajita bowls (spoiler alert: I was right). I also thought that seeing as you only need a small amount of meat, I could splash out on fancy fillet steak. This turned out to be a great idea, as the meat was so tender and delicious! 300 grams of beef was good for my four lunches, but obviously scale up or down depending on your appetite. Really, all you're doing here is cooking the fajita mix of beef and capsicum, chopping some tomatoes for a tomato salsa, and mushing up an avocado for guac. Everything else is just assembly! (I used half a green and half a red because I had them lying in the fridge; ordinarily I'd say just buy one capsicum of your preferred colour). So, put the microwavable items in one container, put your toppings in a separate container, and that's it. We've got vegetables, protein, fibre, iron, good fats, a little calcium from the cheese, and delicious sour cream. (I can't think of a redeeming nutritional feature of the sour cream; I just like the taste a lot and I had half a tub in the fridge to use up - Greek yogurt is an obvious substitute). Delicious, healthy lunches for the week. Better quality and much cheaper than buying similar salads at Mexican food court chains (I checked). You got this! Slice the fillet steak into thin strips and place into a bowl. Season with salt and pepper. Add the olive oil, the lime juice, oregano, smoked paprika, and cumin and stir to combine. Allow to marinade while you get on with the rest of the recipe. Heat some olive oil in a large frying pan. Add the onion and cook until softened, about 5 minutes. Add the capsicum strips and cook until softened. Transfer to a bowl and set aside. Add a little extra olive oil to the pan and cook the steak strips until browned and cooked through. (Drain off any excess liquid at this point). Return the cooked onion and capsicum to the pan and stir through until cooked. Set aside and allow to cool. 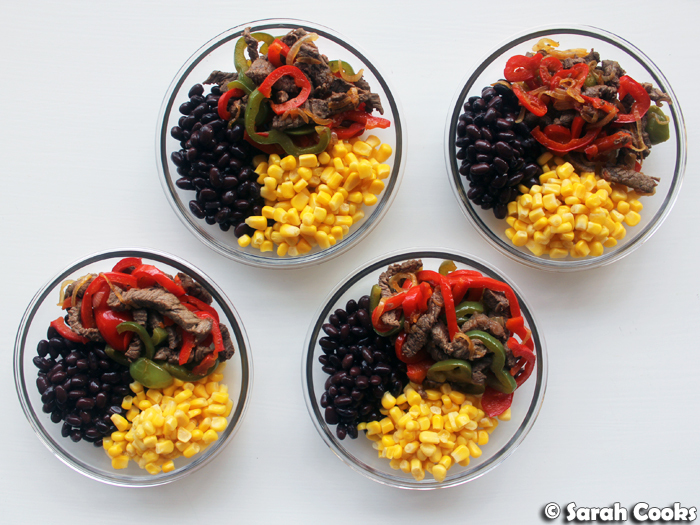 To assemble the bowls, divide the black beans, corn and fajita mix between four serving containers. Place the sour cream, grated cheese, tomato salsa and guacamole in a separate container(s). To serve, heat one container of beans / fajita / corn in the microwave, then top with sour cream, grated cheese, tomato salsa and guacamole. Chop 200 grams cherry tomatoes into dice and add to a bowl. Core and finely dice 1/4 jalapeño chilli and add to the bowl. Squeeze over the juice of 1/4 lime. Season with salt and pepper and set aside. Add a handful chopped coriander, and a drizzle of extra virgin olive oil. Finely chop 1 spring onion and place in a small bowl. Add a generous pinch of salt, a grinding of black pepper and the juice of 1/2 lime, and 1/4 finely chopped, de-seeded jalapeño. Mash in 1/2 large ripe avocado. Stir through a small handful of chopped fresh coriander.